An industry opposed tax increase on Britain's fixed odds betting terminals has forced the closure of 109 William Hill betting shops. William Hill, the largest bookmaker in Britain, spoke up back in February about the negative consequences that the proposed tax increases on terminals offering fixed odds betting could cause. Those for the imposing of this taxation were quick to speak up about what they see as the downsides of these accessible and sometimes addictive methods of laying down bets. The other side of the debate also pointed out that these businesses employ thousands of workers across the country in this time of recession, some of whom would have to be downsized in order to keep operating costs low. William Hill's Ralph Topping, the Chief Executive, expresses the displeasure and discomfort of having to make these cuts for the good of the business being able to continue at large. He said, "This is particularly disappointing as, through the economic downturn, we have worked hard to grow our retail base but this further planned increase in indirect taxation makes this action necessary." 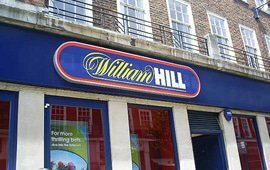 The tax was raised anyways, from 20 to 25%, costing William Hill enough revenues to feel the need to close down a significant portion of their 2400 locations, amounting to 109 shop closures. This downsizing comes with more than just the buildings themselves being shut down as this round costing 420 people their jobs in a time when work is hard to find. This is all in response to a first quarter loss of 14% drop in profits from their bookmaking sites. This loss was further reinforced by two consecutive weekends where bettors raked in huge wins with top teams churning out wins in soccer. Further effects on the bookmaking industry have yet to show their effects through smaller businesses but are surely coming. The consequences of the warnings made about the tax increase have been felt and reported about mostly about the biggest names, such as William Hill, because their total income loss is the most noticeable as well as the number of people affected as a result. Without a doubt, the coming weeks and months will continue to show the ripple effect as more and more sports betting companies see the decrease in income and are forced to react.